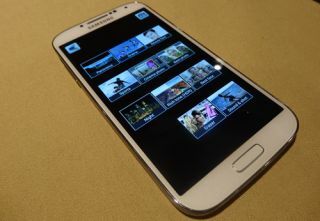 Samsung Galaxy S4 UK model to have quad-core not octa-core processor | What Hi-Fi? The Samsung Galaxy S4 UK model will have a 1.9 GHz quad-core processor not a 1.6 GHz octa-core processor, Samsung has confirmed today. This represents a change of tune from Samsung on the subject of the processor in the UK Galaxy S4. We already knew that there would be two models in existence for different markets. One with a 1.9 GHz quad-core processor, one with a 1.6 GHz octa-core processor. Having told us at the Galaxy S4 pre-briefing that the UK model would be the Exynos 5 octa-core model, Samsung has now confirmed the handset on sale in the UK will have the quad-core Snapdragon 600 processor. In a statement, Samsung said: "Samsung Galaxy S4 is equipped with a 1.9GHz quad-core processor or a 1.6GHz octa-core processor. The selection of application processor varies by markets," it reads. "In the UK, the Galaxy S4 will be available as a 4G device with a 1.9GHz quad-core processor." Samsung Galaxy S4 is equipped with a 1.9GHz quad-core processor or a 1.6GHz octa-core processor. In the UK, the Galaxy S4 will be available as a 4G device with a 1.9GHz quad-core processor." How this will affect performance remains to be seen, with the octa-core processor always set to work as two quad-cores rather than the full octa-core experience. How many tasks would even require this perceived extra processing power is also up for debate. The Samsung Galaxy S4 is set for release on April 26th in the UK, with a rumoured price tag of around £500.